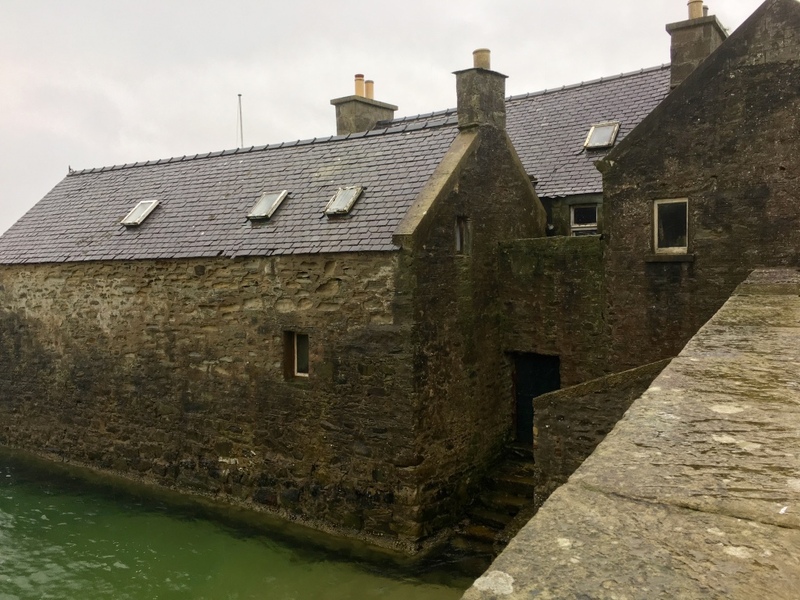 Here’s my friend Veronica’s report from Shetland Wool Week 2017. I’m so happy she wants to share her experience from this years wool week here on my blog, thank you so much Veronica! Her post is awesome, enjoy! Hi Everyone! 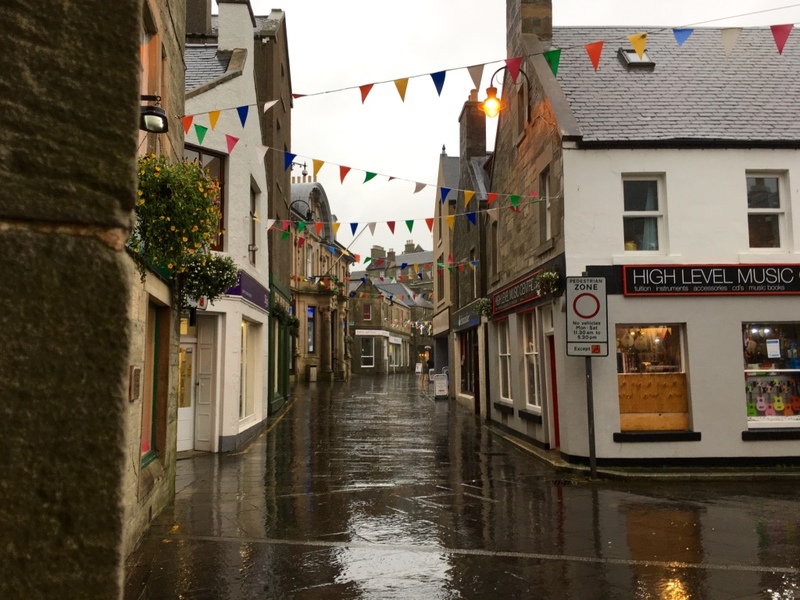 My name is Veronica and last year I was lucky enough to get to go to Shetland Wool Week 2016 with Barbro, and a mixed group of people some of whom had been before, and some who had not. Barbro blogged about this trip. 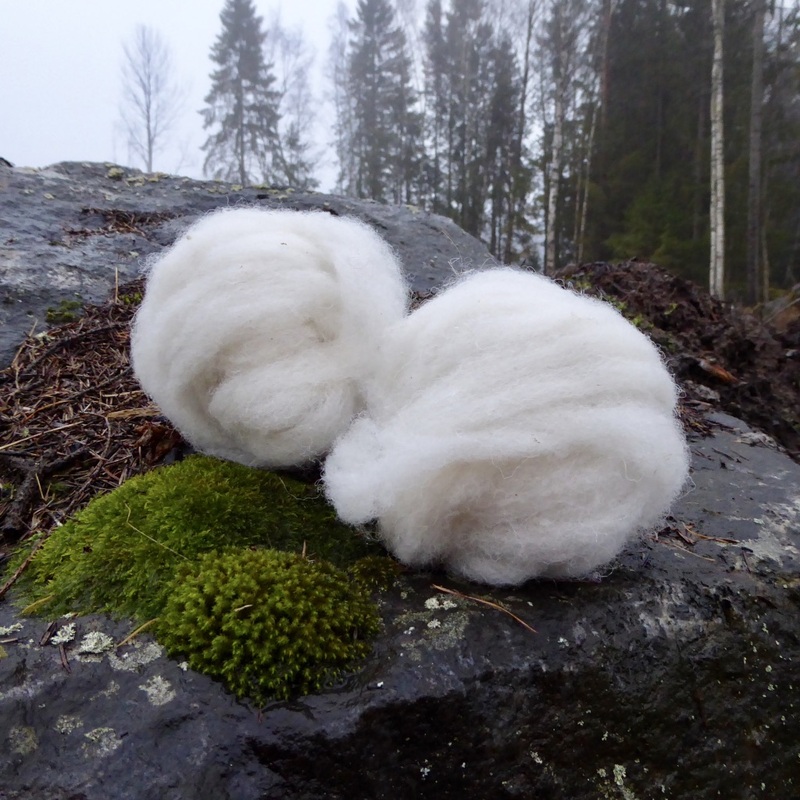 (Barbro’s comment: I wrote several posts about Wool Week in October 2016). The whole experience reminded me just how special Wool Week was, so I couldn’t resist taking the opportunity to go back again this year on my own. Barbro said I could guest blog about it here for all those of you thinking about going. 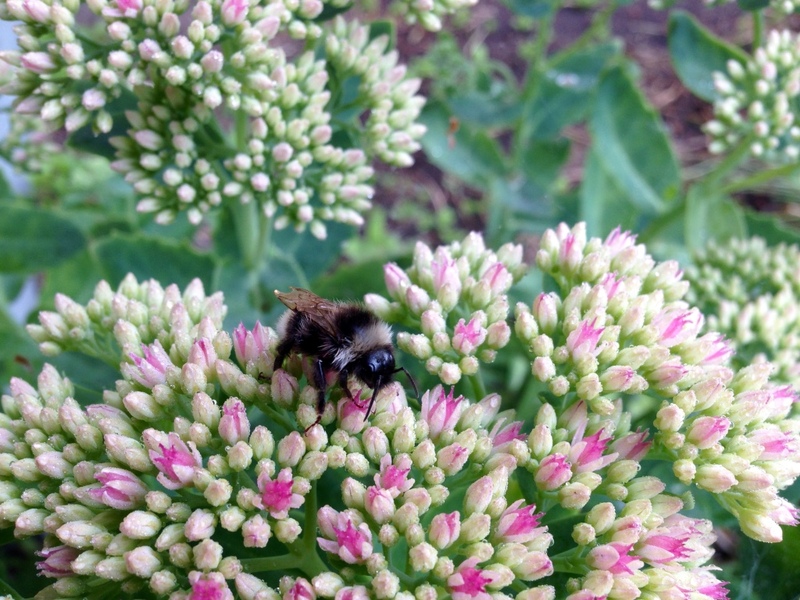 Here’s what I did…. As I touch down at Sumburgh airport there is a beautiful sunset over the hills to the west, It’s good to be back! Time to get started! I kick off with some light shopping and my first class. The class is a spinning class at a very tiny but cute venue called the Lodberries. This is the road where Jimmy Perez’s house can be photographed. The class only has four places, and if you see the space you will understand why, but it is lovely. We do “Spindle Spinning and the Muckle Wheel”. It’s a nice gentle class – my main take-away is remember not to grasp your fibres in a death-grip when spinning. And the big feature of interest is of course the “Muckle, Great or Walking Wheel”. A very interesting bit of kit, which is almost like a spindle on its side. A giant wheel and a wooden stick or spindle on the side which you do all the spinning on. No bobbins, no Mother of all, no scotch tension, no complexity. While we are there we have several visitors. One is a local boy doing a photography project, and one is a lovely man of advanced years who used to work in this shop as a messenger boy when he was 14 and it was a wool shop. Best job he ever had! There was also chat. Apparently Mabel Ross’s nephew once stayed with the lady running the course on Fair Isle for reasons entirely unconnected with spinning. 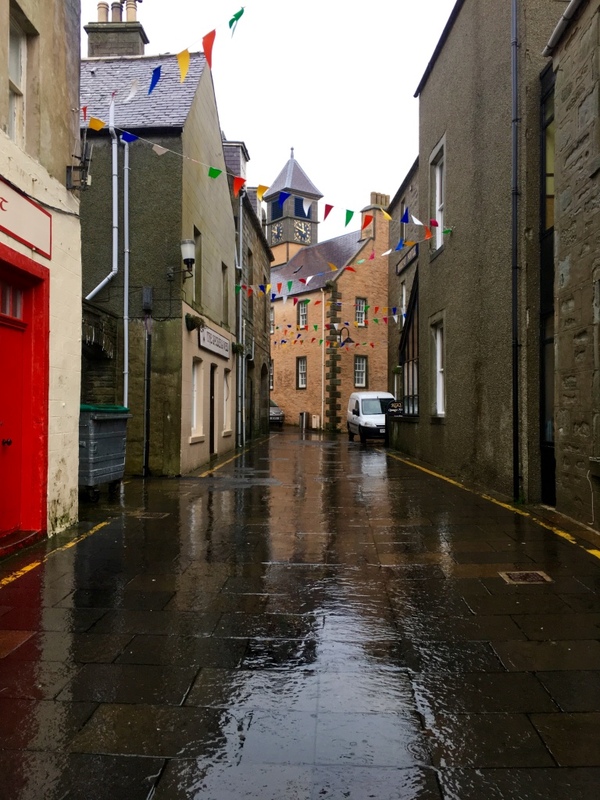 Shetland is that kind of place…. Rest of the day is my big shopping opportunity (highlights are yarn, books and Fair Isle patterned chocolate). I also fit in a trip to the Bod of Gremista / Shetland Textile Museum to see this years exhibition on Victoria Gibson. I make it to the museum or Wool Week hub with ten minutes to spare before it closes. I’m a bit grumpy about what seem to be reduced opening hours this year, but very happy with the merchandise, which is better than last year. The logo this year is great. Class 2 – Felix Ford and “Quotidian Colour work”. Felix is a previous Wool Week patron, and this is the class of her first published book. It’s a method of dragging design inspiration out of boring things. We have to take an inspiration object, match the colours, graph out a shape from it and swatch it. It’s a good class, and pretty much what I expected. Main takeaway? You don’t always have to spend hours pre-designing a perfect chart, then swatching it to prove the chart works. In a very modern, Agile kind of way just move fast and break things, i.e. just swatch without worrying. You may get something better than expected. Class 3 – Amy Detjen. This is a techniques class on stranded colour work, so basically we swatch to practise the techniques. I got what I needed out of this class in terms of using both hands and wrapping floats on either hand. It was also suggested to take a video of yourself doing the technique. I did this in another class and it is a really good idea. Reception! This live streamed on Facebook, so you may or may not still be able to see it. It was pretty good, although one of the speakers was universally agreed to be a little dull, and unlike last year there was no paid bar. The food was good. There was also a bit of a joke which utterly bombed. The presenter (same as last year and very good) made a joke about people gatecrashing. I think she was just trying to say that it was such a great event that even the volunteers had come in to see what was going on, but this got lost in translation as hundreds of people who had not paid crashing the event. Be careful what you joke about! It was taken as truth and not well received by some. Most of the day I spent on the “North Mainland Tour”, i.e. a coach trip. There are lots of trips put on during Wool Week, which are good for those who don’t hire a car. We did lunch, coffee, a cliff walk (more Jimmy Perez – this is where he chased a man over the cliffs), and Tangwick Haa museum. This was a little treasure, which I think needed an hour to appreciate, not the half hour we got. The real purpose of the trip was to take us to the village hall at Ollaberry to see the haps. I think they left us here a little too long, but it was a lovely display, loads of cake of course, things to buy, and I spent most of the time watching the fingers of a master spinner at work. Not bad. I spent the evening at Class 4 – Knitted Bangles. This class gave us wool, a choice of patterns and a bangle to cover. I think this one was a bit of an under-appreciated gem myself. The number of attendees compared to the number of places that had been advertised was low, but I liked what I made, and it gave me loads of ideas for ways to take this concept forward and do different things with it. It was run by Helen Robertson an interesting local Shetland lady, and if she puts it on next year I encourage you to go. Bangles, Baubles, no birght shiny beads. 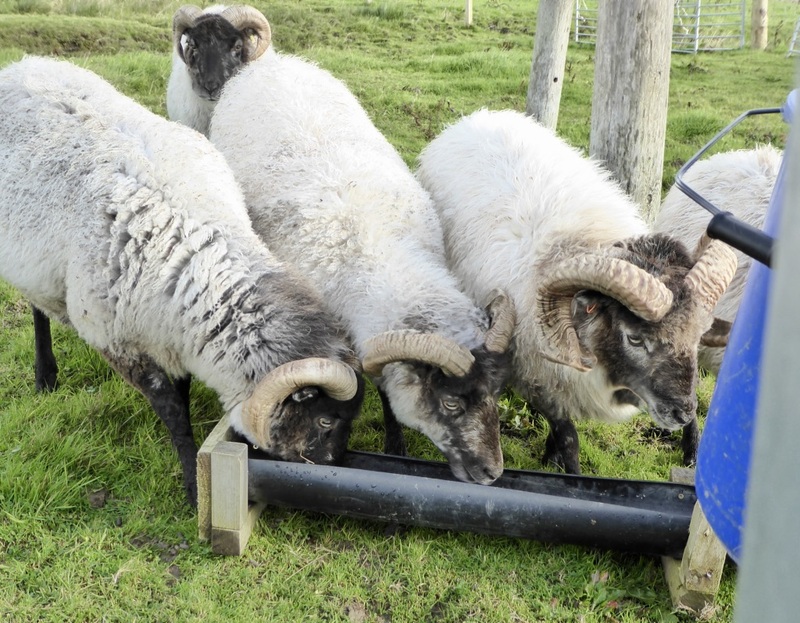 Class 5 – “Fae Ewe Tae You”. A fine lace spinning class with a local lady. Interestingly I had read an old newspaper snippet about her at the Ollaberry event the day before. This lady was very comforting about the joys of spinning in the grease, and simple preparation combing staples. I love making rolags, but for my actual spinning I do find combing better. That’s just me. I got a nice sample of lace-weight thread out of it, which I will knit up later. Class 6 – Felted Creatures – or felt your own Trove (Steland troll). Of all the classes I took this is probably the one I could have ditched. Nothing wrong with it, a perfectly good class, but I have done something very similar making felted gnomes for Christmas, and this didn’t offer much over and above that. A group of ladies from Iceland loved it mind! Class 7 – Victoria Gibson swatching. This class was tied to the exhibition at the Bod of Gremista. The short version is that an art-school lady called Victoria moved to Shetland and did some interesting and innovative things with stripy jumpers and chunky jumpers where the focus was on the texture and the mixture of colours. They were all knitted locally by an army of home-workers, including the whole island of Papa Stour at one point! And then oil came, and the business ramped down. In this class Victoria herself and Lizzie who had curated the exhibition helped us do a swatch in line with her most iconic jumpers. I must admit I like the technique, and I absolutely loved the swatch I made in autumn shades. Good food for design thought here. I whipped along to the “Year of Techniques” Trunk Show at Jamieson’s and Smith, before heading off to the Isleburgh Knitting and Spinning Group evening. I have to be honest, and say I mostly enjoyed cake and chat. I passed the Marie Wallens book launch, and that looked packed. After a leisurely breakfast at the Peerie Cafe, Class 8 – “From lace to chunky”. This class was at Vaila Fine Arts on the main street. 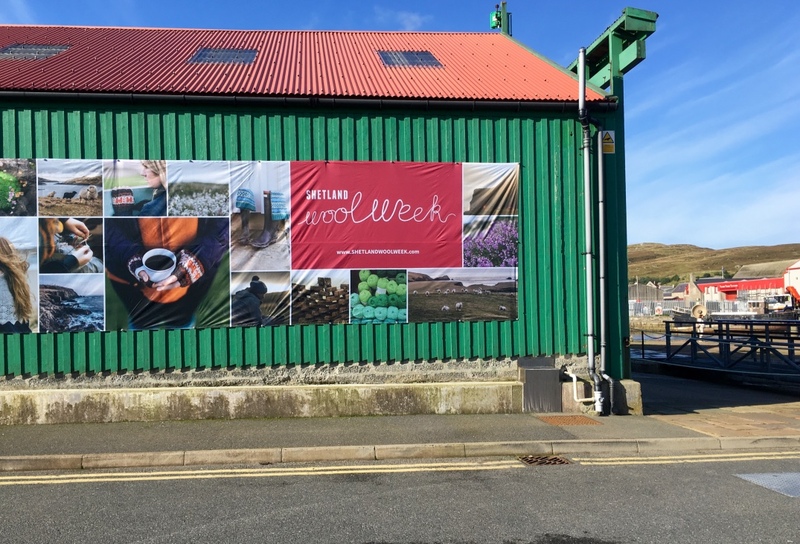 It’s an art gallery the rest of the year, but for Wool Week the Shetland CIC take it over. They are the third main yarn producers on the islands, and they produce organic wool. They do a lovely display, and it’s worth visiting the shop just to look round. This was about knitting in different weight yarns in a lace sampler. It is surprisingly difficult to swap from chunky to lace-weight in one sample I found! The best part of this class was the very clear pattern layout. The lady had written up various simple lace patterns in both chart and written form herself on her home computer, and she had done a super job on it – very easy to follow. In the afternoon I did the Jamieson’s Tour, and I’ve got to admit this was a surprise revelation. I’d had various bits of advice about this tour. First was it’s a lovely drive out – true. The scenery on the way to Sandness is spectacular, and although this is very much a trip to see the Jamieson’s factory not a coach tour, i.e. no commentary, it is worth it for the drive out alone. The tour is split into two groups. I had been warned to do the first tour which goes round the factory then the shop so that I could go and sit back on the bus if I wanted. This was on the basis that both the shop and the coffee room (yes, there is a room with free hot drinks and cake) are very small. This was good advice, but I did it the other way round, (shop then factory tour), because I personally had no trouble spending an hour shopping up front, (and drinking coffee) and could have used longer. Horses for courses. The tour itself was very interesting, and I am in awe of their business, which I think must be a very difficult one to run. They process the fleece, dye it (this is clearly their number one USP), spin it, ball it, weave it, make clothes from it, and sell it. Gary Jamieson himself did the tour, and he is an excellent ambassador for his family’s business. Kudos. As a nice bonus you get three free balls of yarn on this tour, and this and another subsidised event were the best value for money events on offer. 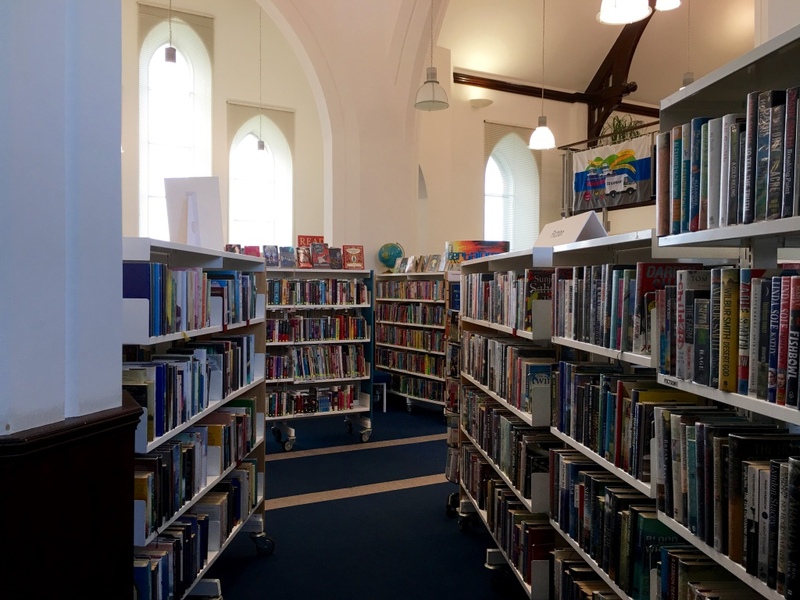 In the evening was “Stitches from the Stacks”, an event at the Shetland library, where apparently Outi Kater works, because she was running it. The focus this year was much more on browsing the books, which they had piled up everywhere. There was also the obligatory cake. It is a lovely event, and a great way to spend some time in the evening. 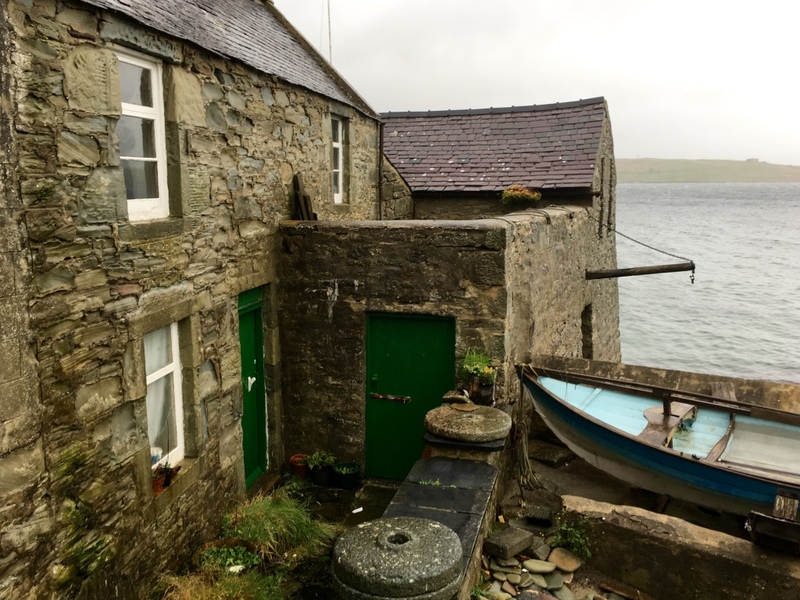 An opportunity to go to Bressay. I have been to a number of the Islands now, and it was nice to tick another one off the list. However, today was not the day. The weather was terrible. I went to spend some time hanging out at the hub in the museum and drinking their delicious coffee. 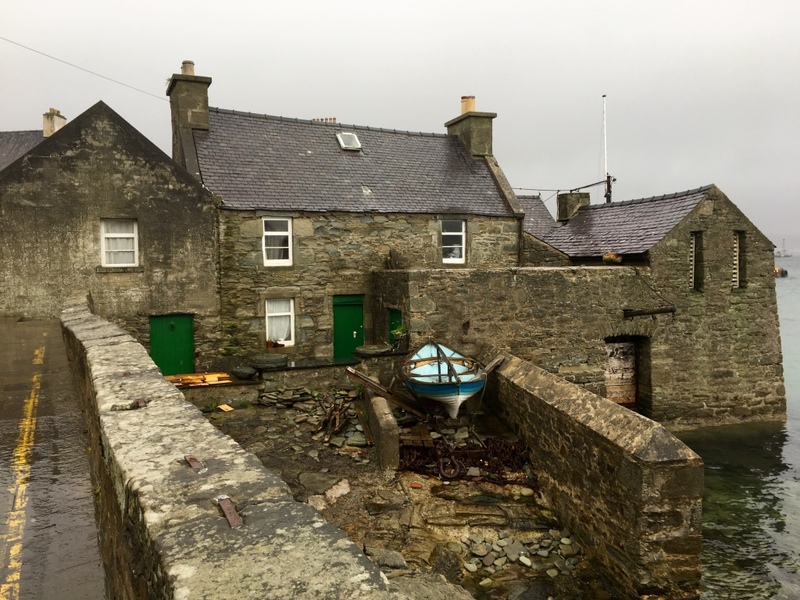 I then ran through the rain to catch the foot ferry to Bressay for Class 9 – Horseshoe Lace Knitting. The Textile Museum (Bod of Gremista) possibly with the Bressay Development Association had put a tonne of stuff on for Wool Week on Bressay. Others who did the Croft Tour with Chris Dyer highly recommended it. There was also an option to go just to see the Textile museum display at the lighthouse. I saw this as part of my class, and I will be honest and say if I had gone just for that I think I would have been disappointed. I had chosen to do some lace knitting at the light house, as I thought it would be a nice environment, and it was. It was a good class, and the main thing I learned in this one, is that work by Shetland knitters looks so good because they put extra twiddly bits in THAT AREN’T IN THE PATTERNS. We had a scarf pattern, the lady told us what she would add, and it if you looked at the cover picture it included these extra bits. Grr. Why they can’t just put those in the patterns then, I don’t know, but it’s definitely something to look out for in future. So, a good trip, but all I saw of Bressay was misty windows. In the evening I had two talks. It was back to the Bod for a talk on Victoria Gibson. Although I had already seen the display and taken the class, it was worth going back for the talk. There was a lot of stuff about how it had been curated that made me appreciate the exhibition a whole lot more. I then hot-footed it back to the Museum for a talk by the Ladies of Thingborg. 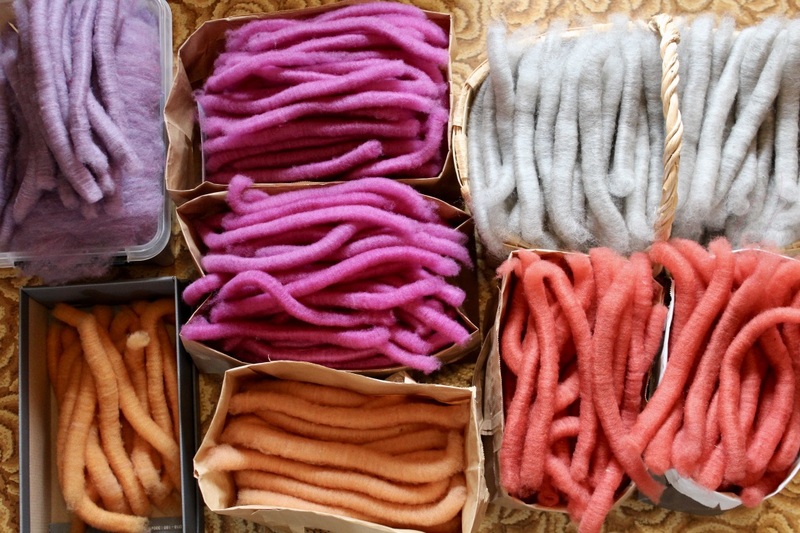 They are an Icelandic collective who run a fibre-based shop and teaching centre. Their talk was very interesting about how they started, how they got the building and what they did. I have to give praise to the ladies who did a talk over an hour long in their second or third language and indeed what they have managed to build at Thingborg and what they do there. These are just ordinary women with jobs and families who do this in their spare time. Class 10 – “The Beauty of the Icelandic Ocean” with the Ladies of Thingborg. They brought some of their hand-dyed Icelandic wool for us to buy, and a pattern for a nice shoulder shawl using the wool. This was a very simple pattern which I got a great start on over the weekend. (Easy to knit garter stitch triangles you can chat over). The main focus was on the wool itself, and the lovely colours. At lunchtime I ran to town to post some stuff home. I had been hesitant to do this, but everything arrived safe, sound and quickly and I was very pleased I had done it the following week. Shout out to the Shetland Book store who could not have been more helpful with getting a post bag and packing it. 70p well spent. Class 11 – Last class! And I will admit I was flagging a bit by now. This was knitting a mini half-hap with this year’s patron Gudrun Johnson, and I perked up as soon as I saw what we were going to make. It was a tiny hap, big enough for a teddy or doll and super cute. I finished this off over the weekend in parallel with my Ocean shawl, so a quick make. The evening was the last big collective event (or second, there was only really this and the Reception) – a Spree for Cushla. This was a dance in memory of a lady called Cushla who had been heavily involved in Wool Week and the Textiles Museum. I enjoyed this event, but I think it was really a treat for people from abroad who don’t seem to have these kind of local village hall dances and perhaps people from very urban areas who have never done any country dancing or been to a Ceilidh. It wasn’t a Ceilidh, because apparently Shetland doesn’t have those, but it kind of was really. A good Friday night either way, with a bar, buffet and of course the obligatory raffle. (For those who don’t know the raffle is a staple of any event held in the UK in a village hall). The wind-down begins. I went to Jamiesons and Smiths – always a lovely place to hang out in and hung out. From there the bus picked us up for a morning based on the Flockbook. Last year the real Flockbook was on at the Mart (again Barbro blogged about this, and got some prize winning fleece (Barbro’s comment: I will work with this fleece during Wovember this year. My friend Kerstin from Sweden, also attending Wool Week in 2016, bought the other two winning fleeces). This year the Flockbook was on the week after wool week, so they put on a fantastic event at Gremista farm. Eric the farmers own well-bred Shetland sheep were there, but they were mostly white, so a couple of other people had brought some coloured sheep to exhibit. There was a barbecue, free booze, fleece to fondle and a talk about both the sheep and Wool on the hoof. Nice. After this I dashed to the Makers Market. Busy, but not rammed. 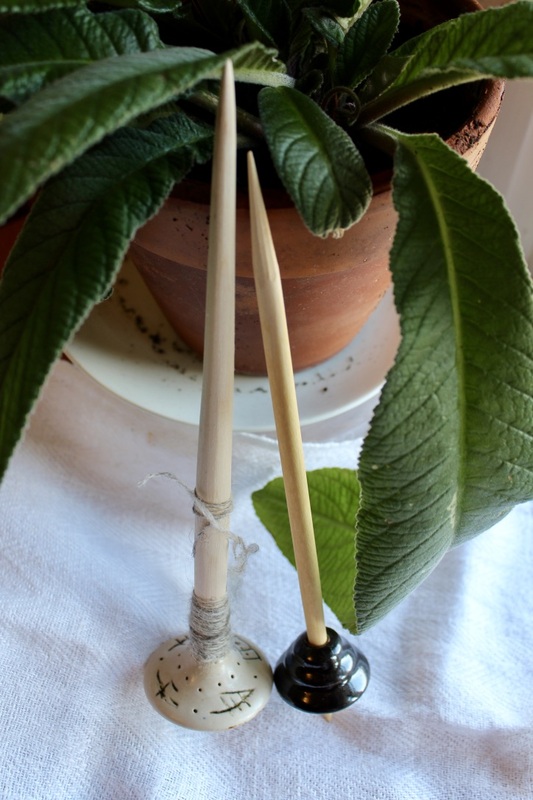 I did some shopping, including treating myself to the hand-spun kit for one of the Annual designs (so happy I did that! The yarn is georgeous). I then went back to Bressay, this time much more successfully. The weather was divine. I went on the ferry, walked to the Cafe, had refreshments, looked round the charity shop, the display of garments from the Reception fashion show, and the other displays. Bressay is amazing. 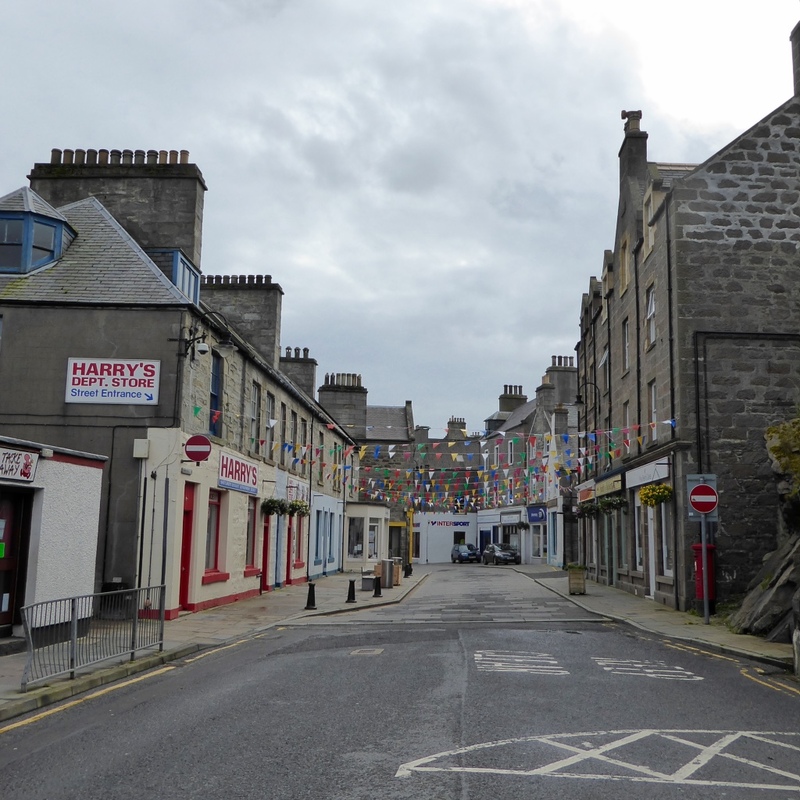 It really is rural Shetland, no question, but on the east coast you are staring straight at Lerwick. I like it a lot. All the literature kept saying the cafe was 15 – 20 minutes walk from the ferry. I’m not sure about that. On my way back I sped up, and sped up, and sped up again, and yet I am sure I would have missed the ferry by a couple of minutes if a very kind lady had not given me a lift for the last few hundred yards. Allow plenty of time! I didn’t see their Heritage Centre, but those who did loved it, including a professional archaeologist. Apparently it is small, and has a Burnt Mound in the grounds!?! One for next time. Last Day. I had stayed on specially to visit the Sunday teas this year, and I did that by going on a coach tour organised for this purpose. 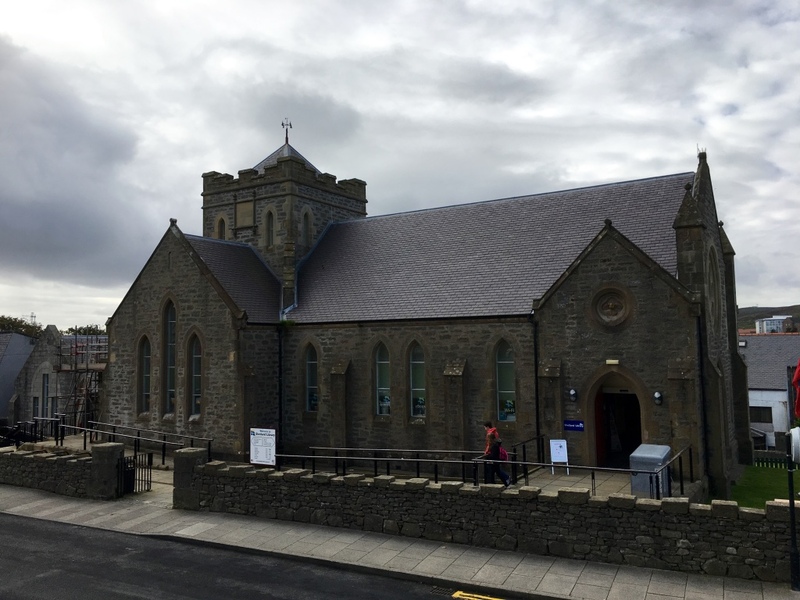 Those who went to Sherry and Sharing at Hoswick loved it – these and the Tingwall teas were the two main events and several people went to both. I just did Tingwall. The weather started nice and deteriorated over the day. 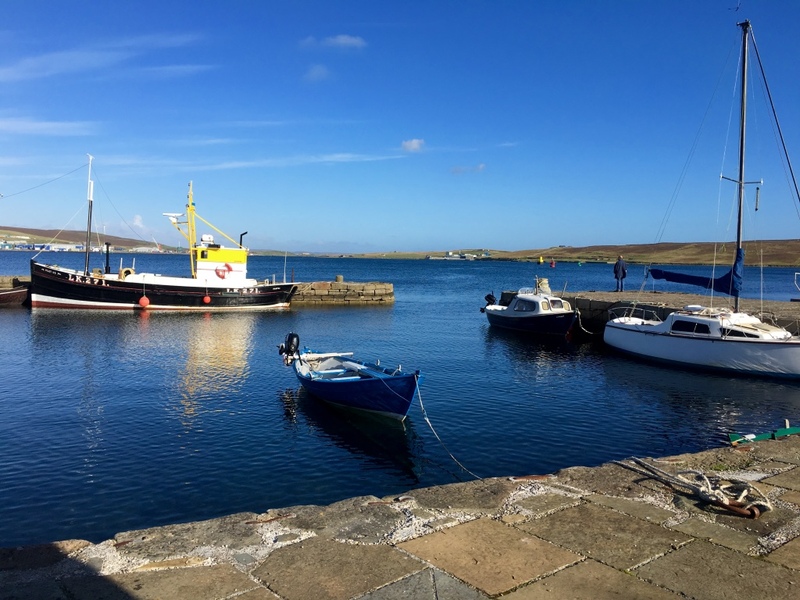 We drove to Scalloway in the sun, and took pictures from a view-point. 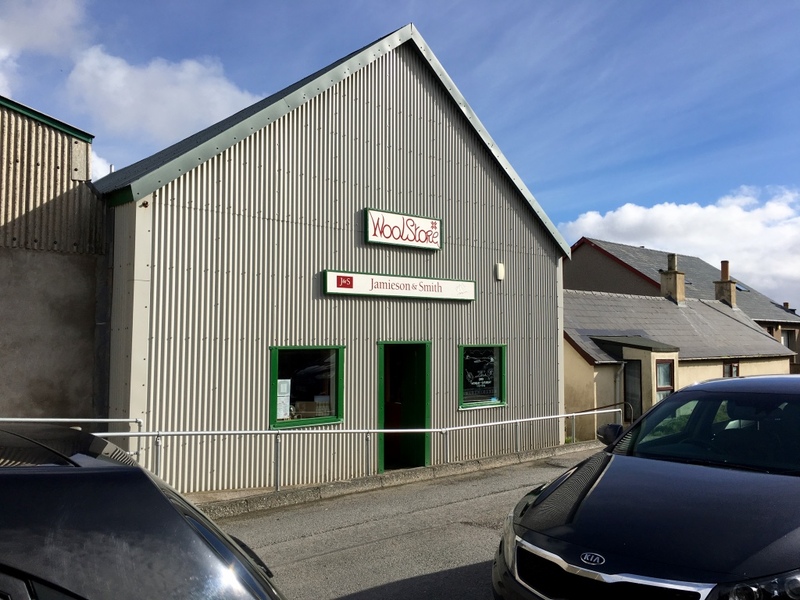 At Scalloway we saw the museum (small, but a lovely little place. A very small textile display, and a lot on the Shetland bus). We also saw the castle. The wind turned into rain, and we went to see some Shetland ponies. The owner was very enthusiastic and the ponies were lovely, but some people chose to stay on the bus rather than get soaked seeing them. Then we went to the hall at Tingwall. 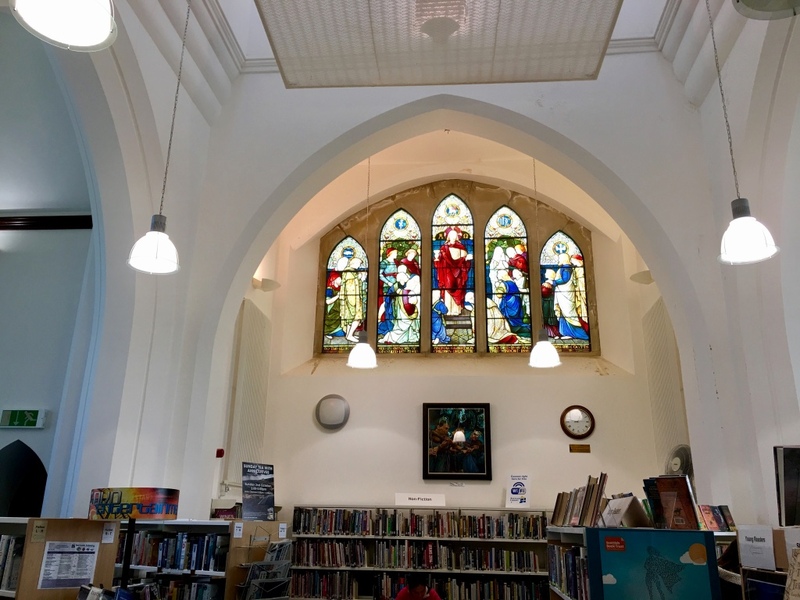 This was teas (hot drinks, lots of cake and sandwiches), a display of work, and a display room where the knitting and spinning was being demonstrated. I think we arrived at just the wrong time, as the place was swamped, but it did die down. There wasn’t a lot else to do on the Sunday, so I saw pretty much everyone who had been involved in Wool Week there. And that was it. Wool Week. Done. Will I go again next year? Weeeeeeell. Let’s just say I might have booked some accommodation already, and leave it at that. Just two weeks after Wool Week finished Loch Ness Knit Fest happened. In some ways it’s a bit close to Wool Week both in terms of both time and location (yes I realise Inverness is a very long way south of Shetland). Nevertheless I went and saw quite a few Wool Week faces there. Some were locals, but there were a few ladies from abroad too. If you have the time, you can tag this on as part of an extended holiday involving Wool Week. Sadly I couldn’t get more time off work to take the Friday off, and I don’t know if that impacted my enjoyment or not. This event runs Friday – Sunday and is based on the Danish Fano Strikkefestival. This was only its second year, the organisers are clearly trying very hard to build it, and I wish them luck. I kept having to remind myself it was NOT Wool Week and not to compare apples and oranges. Wool Week is it’s own very special and unique take on a knitting festival. Loch Ness Knit Fest is a bit more like Cumbria’s Wool Fest or WonderWool Wales (both great events). The format is pinned around the show which is various vendors and some displays. I liked the activities on the stage, which included some very soothing harp music. The bagpipes during class were maybe less soothing. I went for the classes. There were quite a few of these, and I managed to pick up two I missed at Wool week, including one with Hazel Tindall, as well as an extra one with an American tutor for something different. That one was actually my favourite. They also put on other events, there was a fiddles concert, a dinner, and a cruise of Loch Ness. I did the dinner which I thought was OK for what it was, but over-priced. What I did like was that the event was big enough to be meaningful, and well attended, but not packed out. You could still get classes quite late on for example, compared to the Edinburgh Yarn Festival which has already sold out for next year. This was a very sold weekend away trip, and I look forward to going again next year. Also shout out to a couple of the vendors who were also trying hard, putting on special dye runs and creating patterns just for this show. Good work guys. As always, I got tired of doing just one thing, so I still have all of the blue fleece to card. And I also got out of storing space! 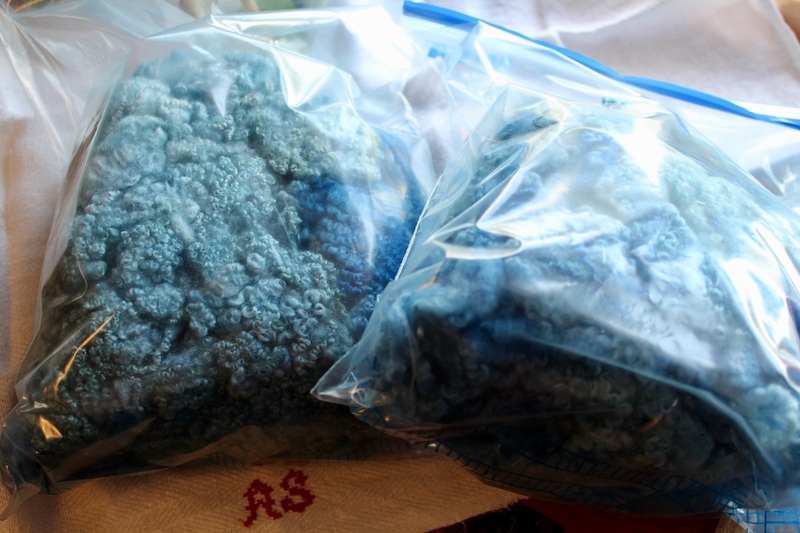 Carded wool can’t be pressed down into plastic bags just like that, it needs a lot of storing space. I hope you can see through the plastic bag how crimpy this wool is. It takes a lot of time and effort to tame it into spinnable rolags. I open it on the drum carder in 3-4 passes, and hand card into rolags. Spinning is pure joy! I spin the way I love the best: long draw on my Swedish Saxony. I also finally finished two spindle shafts I made last year. I wasn’t satisfied with them, so I took my knife and sandpaper and made some improvements. They work fine now. The whorls are made by a Swedish ceramic artist and spinner, Lena Bergsman of Rostocks Keramik. You find her on Facebook. First I want to thank everybody for your kind get well wishes! I’m getting stronger with each day. I’ve even started spinning again! 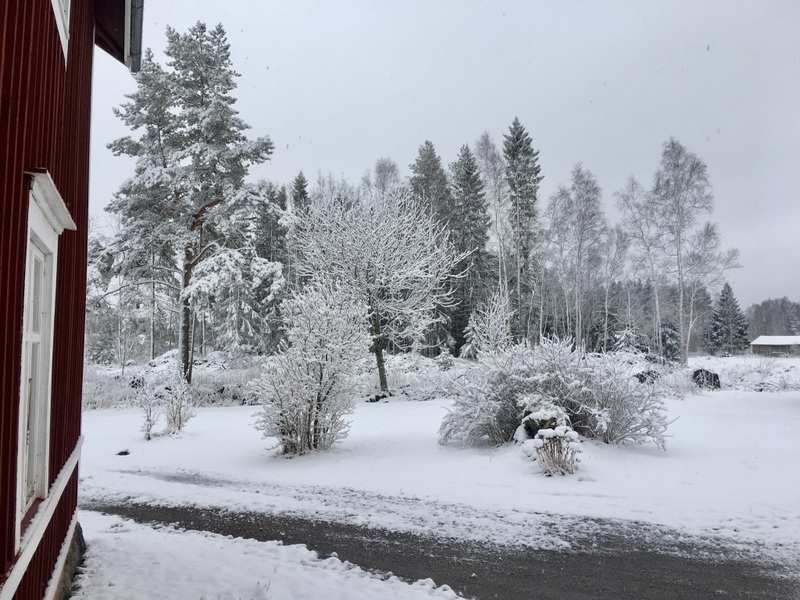 So, let’s start with a post I had intended before I collapsed in Stockholm at the beginning of December: Boreray yarn. I was able to buy a fleece last spring. The fleece is rooed, as Boreray sheep loose their fleece naturally. Rooed wool is longer than it would be if sheared. 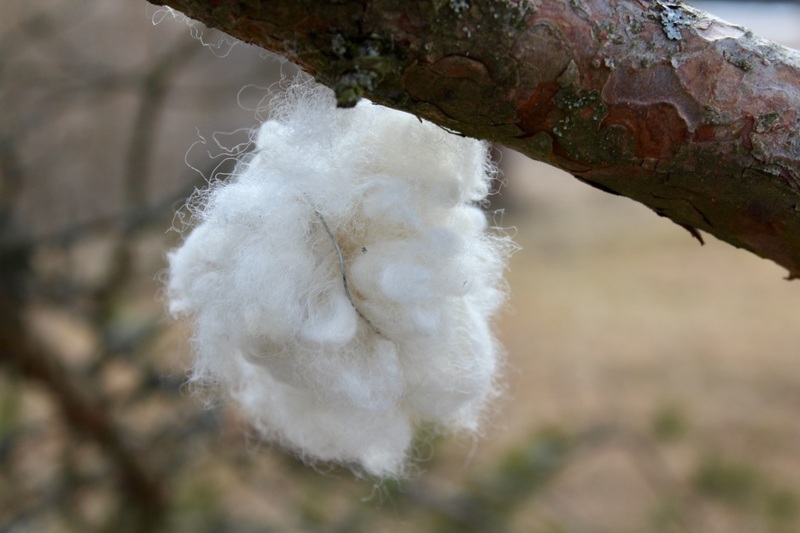 The fleece I bought is very white with a few darker fibres. I still haven’t been able to spin the darker bits that I picked out, but I have stored them in my spinning room and not in the attic so there’s hope for spring! 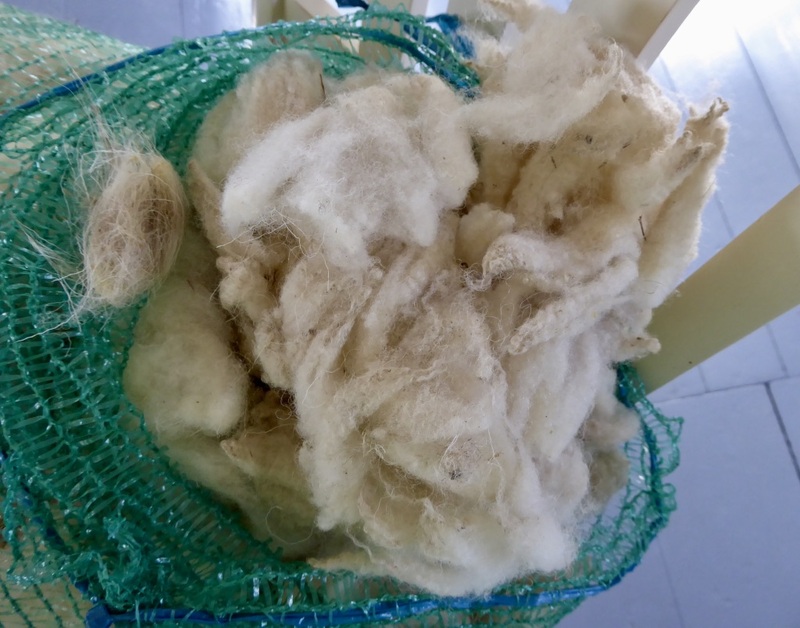 The fleece was very clean, so I gently scoured the fleece only to remove some of the lanolin. The fibers have a lot of crimp, which makes it difficult to card if you leave all the lanolin and card without warming the fleece first. 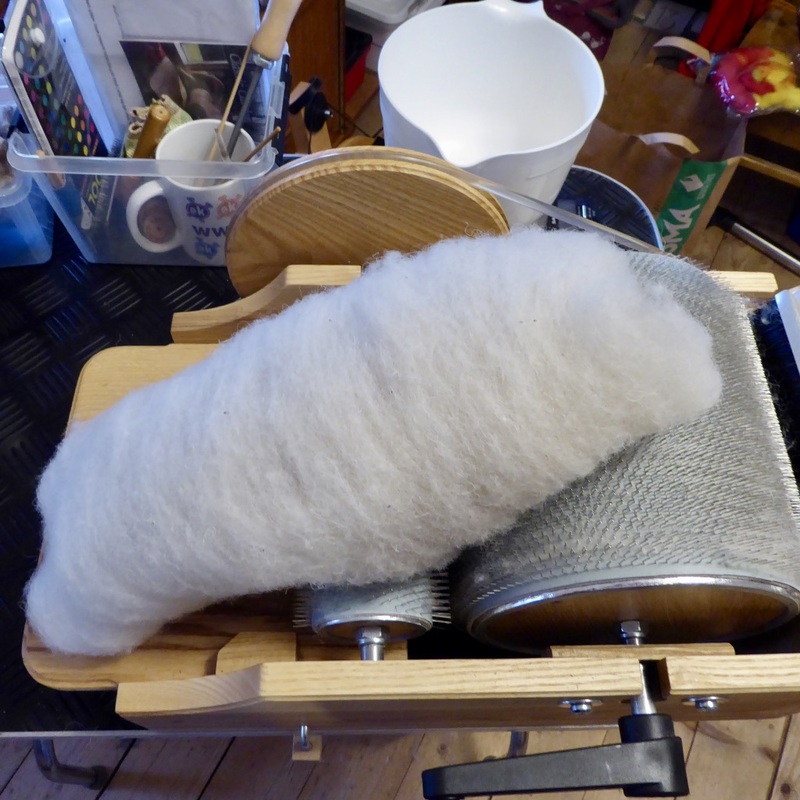 I find that a bit difficult, as you must also warm the rolags/batts before spinning, so I prefer scouring. 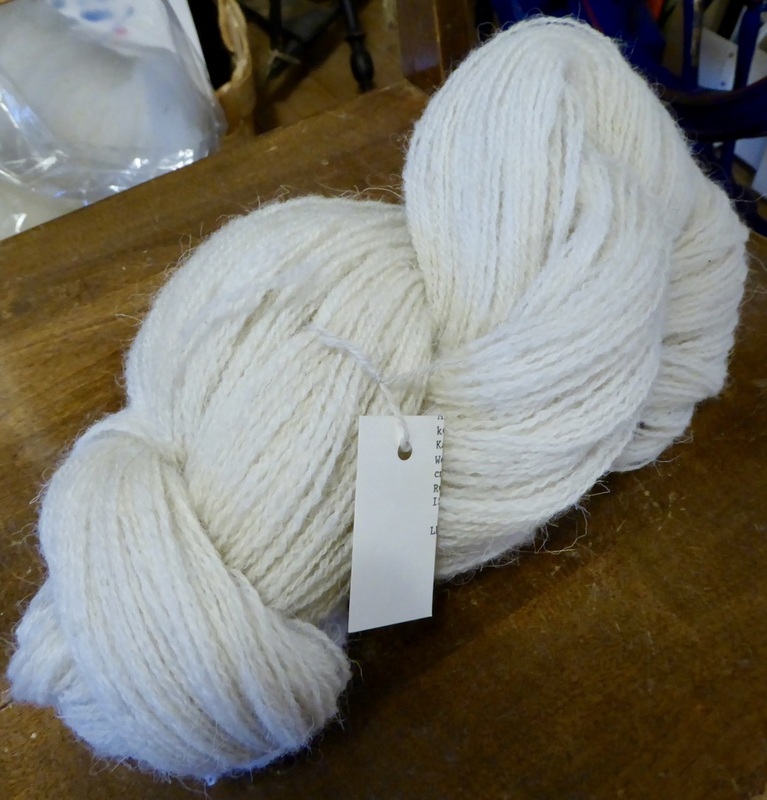 I split the batts lengthwise, predrafted, and spun with a woollen draw and very little twist. There was quite a lot of kemp, but most of it fell out during carding and spinning, even more in the finishing bath, and what’s left can either be left in the yarn or be picked out while knitting. I’m so pleased with this yarn! A soft yarn for warm hats and mittens! I think I’ll try nalbinding also, even it’s a knitting yarn.